Click on the church tower to hear the sound of the Church bells. 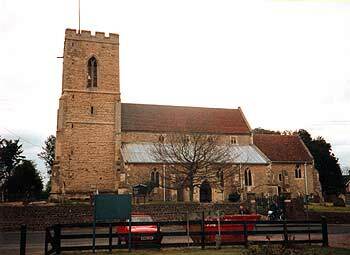 Reverend Lunn moved to Wavendon village in 1993 taking over from Norman Cotton. The congregation at the time was mainly elderly and the Sunday School held in the chapel was not very well supported. Today, most of the congregation comes from outside the village and the Church Council now has younger members. The growth of Milton Keynes, has in general had a good impact on the Church and ensured that St Mary's continues to play a central role in village life. Bell ringing practice takes place on Friday evenings - you can listen to the bells by clicking on the church tower. There is at least one atheist in the graveyard! The gentleman concerned wanted to be buried in his garden, but because of legalities this was not possible. He was buried in a field on the other side of the wall of the graveyard. With the expansion and growth of the graveyard, his grave is now incorporated into it. - Thus, he may still have entered into Heaven!